A major research study into sorcery accusation-related violence in Papua New Guinea has found that over the past 20 years, an average of 72 people per year are victims of sorcery accusation-related violence of which an average of 30 people per year have been killed. This is likely to significantly under-represent the true number of incidents, as this number only reflects those reported in the media and in court reports. The study indicates that the major trigger for sorcery accusations is a death in the family or community. The study also indicates that when local leaders, such as human rights defenders, church leaders or police intervene, violence can be averted. The Pacific Women-funded research has been underway since November 2016 and will run for three more years. It is a partnership between academics at the Divine Word University (DWU), the National Research Institute (NRI) in Papua New Guinea and the Australian National University (ANU). 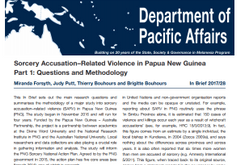 The study will inform the Sorcery National Action Plan (SNAP), which is a comprehensive and multi-sectoral response, passed by the PNG Cabinet in 2015 to overcome the problem of sorcery accusation-related violence.